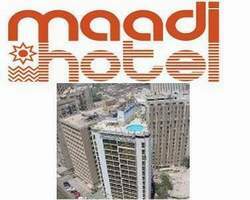 The Maadi Hotel is situated close to the historic River Nile in Cairo's Fashionable suburb of Maadi where large American and European communities live. The hotel is about 15 minutes drive from downtown Cairo and about 1/2 hr drive from Cairo International Airport. The Maadi Hotel offers 150 luxurious twin-rooms and 39 deluxe suites. Most rooms have an exquisite view of the Nile. All rooms and suites are elegantly furnished with private bath, radio, color TV, video programmed, telephone, mini fridge and central air conditioning. Maadi Hotel ball room (100 pers.) can be converted into two or three rooms for private banquets and meetings.